We all know that Australia experiences summer in December, where as the Northern Hemisphere crew receives in snow, rain and sleet in abundance. With a pretty adorable twist on season’s greetings, Haymarket’s Market City is hosting the country’s largest snow globe this Christmas! If you’re in town on business, vacation or a local until New Year’s day, you must get down to the Market because this is absolutely something not to be missed. Imagine stepping into a massive globe (specifically 8.5 meters in diameter, or nearly 28 feet) and kids to experience snow for the first time? It literally runs chills down your spine in excitement with the thought of having a few moments in a gigantic snow globe. The globe will, naturally, feature a Christmas scene, built by professional set makers who have transformed the area into a winter wonderland with the help of some handy snow machines and snow blowers. Grab your mittens-on-a-string, ugly holiday sweaters and knitted hat for a unique experience. If you want to go the extra mile and enter to win $1000 in shopping vouchers, then take a selfie in the globe and follow @marketcity on Instagram, while you tag your snow-selfie with #mcsnowglobe. As a double bonus for students, check the Market City web page for discounts and deals. For all parents visiting Sydney to see their son or daughter at university, drag them down to the market and while you’re there, have a browse around at the stores. From food to gifts (last minute Christmas presents? ), novelties to electronic, the market has all bases covered. Directly located above Paddy’s Markets in the center of Chinatown, this is the only shopping destination in the area with 30 factory outlets. After a chilling thrill, take a balmy one hour stroll up George Street to Circular Quay, followed by a short ferry ride to Cremorne Point. The skyline views of the city are stupendous and Cremorne Point Manor boasts one of the best spots to view downtown Sydney at its best. If you need additional coaxing, check the hotel’s home page video and you’ll see why Tripadvisor gave the Manor a Certificate of Excellence, 4 years in a row. You may have just experienced an oversized bubble yet now you can enjoy one of the most famous landmarks in the globe! For all water sport fans, if you’re in Sydney from 12 – 14 December, get ready to ride the wave…or watch it. For the first time, the Extreme Sailing Series hits Sydney Harbour in this grand finale for the 2014 season where the pro’s will compete for the coveted trophy. Some of the best sailing teams from around the globe (including the Australian flagged squad of GAC Pindar) will go head to head on identical extreme 40 catamarans. Their route will include maneuvering around tactical courses that are so close to the shore line, you’ll get the best seat in the house. In its eighth year, over the past 11 months, tour locations have included the UK, France, Singapore and Russia, with the finale now reaching Sydney. The end location choice is ideal based on the city’s miles of ocean coastline and sandy surf beaches, oh, and incredible weather since it’s now summer in Australia. The Series will be held by the Harbour between Garden Island and the Opera House. The organizers highly suggest you hop over to the Race Village at Mrs Macquire’s Point but for all Cremorne Point Manor guests, you have one of the best views in the house from the Point at Sydney’s North Shore. You’re guaranteed exceptional views! If you do head to the official Race Village in the Royal Botanic Gardens, you can bring your own food & drinks or support local businesses from buying at their stands. There will be activities and entertainment, courtesy of sponsor Land Rover along with live commentary and replays & live coverage on the big screen. Not only a family friendly event, the Series is ideal for business travellers who are looking for unique events to entertain clients so keep that in mind. On Friday the 12th, the Race Village opens 10.30am and for all three days, stadium racing is from 2.00 – 5.00pm. On Sunday the 14th at 5.30pm, the prize giving for Act 8 and Extreme Sailing Series is at 5.30pm so mark that in your calendars. If you’re a major water buff fan, you can also volunteer and be officially classified as an ambassador of the Series. Working alongside a top tier team, this is the time to develop new sailing skills and meet some of the best sailors in the world. As an added bonus, you’ll also receive a certificate of participation which is fantastic for students who require such credentials for university submissions. Since the event’s nearly upon us, you’ll need to email volunteers@extremesailing.com.au quickly for potential volunteer spaces or fill the online form. For anyone staying at Cremorne Point Manor during this fantastic weekend, let us know if you need advice or help in finding the best spots to watch the Series! The infamous and indigenous Aussie contemporary dance company, Bangarra, will be hosting a freebie 25th Anniversary celebration performance at the Opera House’s Forecourt on Sunday 30 November. From 630pm, this celebration gift to the people of the Eora nation, the performance will be part of Corroboree Sydney 2014. For anyone who’s not familiar with Bangorra’s Dance Theatre history, here’s the Cliff Notes: Founded in 1989 by Carole Johnson, an African American, the word means ‘to make fire.’ They’ve featured 11 productions since the early 90’s including global tours and also significant contributions to the 2000 Summer Olympics opening and closing ceremonies. Now you’re up to speed, make a note to hop over to the Forecourt on Sunday! You can enjoy the Yolngu performance that originates from the North East Amhem Land with MC by actress Deborah Mailman. There will also be a brief performance by the NSW Public School Aboriginal Dance Company and song stories by Christine Anu (from her Stylin Up album). This event is a fantastic way to learn more about the history of Australia’s ancestors through music, storytelling and culture at one of the most famous landmarks in the globe. This is the first time Bangarra has offered a free event so it’s a rare one, not to be missed, so bring your picnic and be ready for the 630pm celebration. We also advise you to take a quick look through Bangarra’s website for additional information about their venue in Walsh Bay, alongside future performances and history behind each style of dance. As a leading performing arts company, this is an ideal event for business travellers who want to learn more about local arts and culture. Obviously, it’s an extra perk for budget corporate visitors who can invite clients to the celebration and keep entertaining budget costs down. Once the final ‘curtain’ draws, you can dance your way onto a nearby ferry and a few minutes later you’ll be at Cremorne Point. Still keeping checks and balances in tow for hotel accommodation, Cremorne Point Manor is one of Sydney’s most affordable boutique hotels, overlooking the Harbour Bridge. With incredible views and stunning hotel decor, it’s pretty clear to see why TripAdvisor’s awarded the Manor a “Certificate of Excellence,” for a fourth consecutive year. Now you can cross ‘stayed at a heritage building hotel & saw a concert for free’ from your Sydney bucket wish list! Since 1987, the ARIA (Australian Recording Industry Association) has held their annual awards in the heart of Sydney. Recognizing the most talented in Aussie music, the first awards were hosted by Sir Elton John and winners have included household names such as INXS and Crowded House. You can also buy tickets to a multitude of gigs, showcases and events taking place between November 19 to December 3rd. From the newest artists and hottest industry events to ground breakers who have changed the genre of music over the years, put your dancing gear on and get ready to mingle. The big award event night takes place on November 26 at the Event Center at The Star and will be broadcast on Channel TEN. Red carpet showing who’s who starts 2pm so if you’re a super groupie, get down to the entrance and start clicking that smart phone camera. From One Direction to Sheppard, 5 Seconds of Summer to Justice Crew on stage, get ready for the main star guest presenter: Katy Perry! Tickets have now sold out but you can keep checking online for any additional seats they’re giving up for grabs at $79.57 AUD . You’d need get on the site fast to book these once-in-a-lifetime seats. For anyone who’s attending the mass of gigs, maybe lucky enough to have nabbed a ticket to the awards or if you struck unlucky this year on grabbing either, you can still be involved. The public voting is for Aussies only (well anyone with an Australian IP address) so you can still make a stance and cast your vote. Also account that some of the week long gigs are free so hover over the link above and see which events take your musical fancy. As the award venue is right by the Harbour, you’re a hop, skip and jump away (aka by ferry) to one of Sydney’s most affordable boutique hotels. After a few days of music to your ears, you can return to Cremorne Point Manor, put your feet up and watch the Harbour skyline as the sun goes down. If you need additional inspiration, check the Manor’s home page video. The views are stunning and it’s no wonder the Manor’s in the ‘Winner Is…’ category for a Certificate of Excellence Award, four consecutive years…by Tripadvisor. To celebrate female musicians that exude sheer brass, the Sydney International Women’s Jazz Festival is worth checking out between November 5 – 12. For the third consecutive year, the festival showcases some of the greatest composers, players and band leaders from around the globe. The lineup includes Dee Alexander, who will host her exclusive Australian debut. As the website validates, Dee’s received hefty kudos State side for her last two albums which gained five star reviews. As a pioneer in versatile vocals, this is a time to cross ‘seeing one of the world’s greatest jazz musicians’ off your bucket wish list. Alongside Dee, you can also jive-talk your way through Sarah McKenzie and Lisa Parrot’s musical talents. Additionally, Andrea Keller will be performing, and the Fat Yahoozah band (Ellen Kirkwood’s new group) will be a sure fire diversity of hip hop jazz. Something not to be missed! Established in 2012, the Women’s Jazz Fest’s main objective is to magnify this world class international genre with a focus on gender. There are various locations you can hop over to that are hosting the festival including the Foundry 616, The Basement, Australian Institute of Music, The Sound Lounge and VJ’s. The ticket prices do vary from $25 to $45 AUD yet also consider their packaged rates that include dinner with your tickets for an additional $25 - $100, depending on venue. With a flurry of restaurants and bars in the area by the festival, make sure you plan your schedule to eat, drink, dance and listen the best jazz in Sydney during these dates. Accounting that the festival is now underway, the performances start nightly at either 730pm or 830pm primarily. On Saturday, you may as well just wipe everything off your calendar or diary as the Fat Yahoozah’s kick off around 2pm at the Seymour Center Courtyard and as a double bonus, this is a freebie. Also we advise you to check out page 16 for the itinerary as it’s pretty condensed and will help you plan your festival viewing, a whole lot easier. If you’re in town visiting or maybe a local looking for a staycation (added treat), then just 19 minutes drive away or a short bus & ferry ride from the Harbour, you can check out Sydney’s most affordable boutique hotel. If you were moved by the music at the Festival, then expect to be swayed by the outstanding views of the Sydney skyline from Cremorne Point Manor. It’ll be sheer music to your eyes and ears! If you’re in Sydney, either a local or visiting, then keep the 9th November free! The Newtown Festival returns and this year, it honors Newtown Independence Day at the Camperdown Memorial Rest Park. This cheeky claim to fame of independence starts at 930am and runs to 530pm and as one of the city’s largest community events, it’s worth checking out. As an annual tradition, the neighbourhood center raises funds for local community goals, to build a thriving region and support vulnerable and disadvantaged people. If you’re expecting this to be a tiny county fair type of event…think again. It attracts over 80,000 visitors who fall in love each November with the music, arts and grassroots style. There are five stages (yes five) at the festival showcasing live music and entertainment while you prowl around from over 300 stalls. The stalls aren’t just about food and drink, they also focus on creative wares, sustainable products and all items local so when you purchase these, you’re giving back to the hood’s economy. Due to popular demand, there are the usual garage sales, Writers Tent, roving performers and favourites. These include the Dog Show, Kids Zone, Live Art Hub, Eco Oasis, Bike Boulevard and Vocal Local Village. Maybe bring ear plugs as it’s going to be a fantastically noisy day. Reverting to one important showcase of the Dog Show, if you’re bringing Fido to the event, make sure you arrive in the morning as your best friend (ever) could win a prize in one of the 9 events. If your pet has three legs, lost its eye way back when or a tail is missing, no worries. The Welfare for Most Disadvantaged competition is on at 940am and brilliantly, wobbly Fido may win first prize! The organizers don’t charge advance tickets as you’ll be asked to make a gold coin donation at the gates. Every dollar raised goes right back into the neighbourhood, which will, no doubt, give you a great fuzzy feel good rush. Only one hour away by bus and around 25 minutes by car, after the Festival closes you can head back over the stunning Harbour Bridge to Cremorne Point. Needing a place to stay? The most affordable boutique 4 star Sydney hotel is situated here. Take a look at the home page short video and you’ll see why Tripadvisor awarded Cremorne Point Manor a ‘fourth’ consecutive Certificate of Excellence Award. There’s nothing more productive than planning ahead, right? So if you have the Total Facilities Expo in your diary or calendar for 25-26 March 2015, then you need to start working on the fine print details. The only dedicated industry event in Australia, this is where you can truly showcase and create a strong brand presence if you’re in the building, cleaning and facilities industry. With over 65 product categories including maintenance, software + tech and energy management (to name but a few), next year’s expo focus is on education and professional development. Bringing experience and know-how from trusted brands by the creators of AWRE, Security Exhibition & Conference, DesignBUILD and designEX, these heavy weights will provide inspirational platforms to help small businesses attending and exhibiting. If you want to know the real bells and whistles of data, here’s the information: 200+ exhibitors; two days of seminars, education, presentation and key notes; over 2400 visitors, 65%+ exhibitors that generate lead values at more than $26 million. In addition, the event website claims and boasts an impressive 94% of visitors recommend this expo to their colleagues. The website includes the full exhibition requirements and forms for you to submit. Also keep in mind the technology and facilities criteria that the organizers provide, if you’re looking to host a booth. Any additional requirements you have, make sure you submit these early to avoid tech mishaps and installations being incorrect sizes. The floor plan (at the time of this blog post) isn’t available so request this through the email form. It’s all about location, location, location. The last thing you want is to be hidden away in a corner so try request a position near the bathrooms (toilets), food areas and exits. This way, you’re guaranteed great foot traffic. A final tip: Ask the expo organizers if you can mail all your promotional materials, business cards and display visuals to be delivered directly to your booth. This way, you’re not carrying a huge amount of luggage (with extra travel fees) and can call the expo a day or so beforehand to confirm delivery. Finally, since the expo is so close in proximity to a Sydney affordable boutique hotel, check Cremorne Point Manor’s rates to book early for your expo stay. We have many business travelers stay with us, regularly so you'll be in good company and you won't melt your corporate credit card. With a maximum 20 minute drive between both destinations, you can be assured that you’re not spending all your time traveling, as we all know expos will have you on your feet for a good 16 hours a day, each day. At the Manor, it’s our job to make sure you have your feet up in a lounge chair or on a bed, overlooking the Harbour skyline. Check our home page video for a preview…of the view. No wonder Tripadvisor gave the Manor a 4th consecutive year Certificate of Excellence award. On the 12th October, whether you’re in Sydney on business, a local or a tourist you must check out the annual Pink Ribbon Ride! For the past 14 years, this event has raised thousands of dollars for Breast Cancer through various charity initiatives: riders are charged entry fees for attending or you can ask friends & family to sponsor your in the event. Thousands of riders from Girls Ride Out, sponsorship by Harley-Davidson (naturally) and Insure My Ride participate, decked out in every shade of pink possible as they ride through the Sydney roads. Naturally, with all popular events, there’s a fair style atmosphere including a flurry of food booths and entertainment. The most popular activities include stunts, rider training, first aid demonstrations and the exclusive Pink Harley Jumpstart machine which is a ‘free for all to try’ so remember your 1989 Sunset Blvd cap and gloves. Presented by James Tobin of the Weekend Sunrise Weather, Larry Medur from The Morning Show and Logie award winning Aaron Jeffery, you’ll also see a smattering of celebrities who grab their wheels and raise awareness of breast cancer - keep a look out for these A through D’listers! Registration opens at 9am and there’ll be a prize for the best dressed bike & scooter so consider fuschia’ing up your transportation. Rides depart at 10am as the fair day opens and by 11am the registration closes. Within an hour, the checkpoint is closed and riders return for lunch and fair activities. By 2pm, presentations and awards are underway with the event closing at 4pm. If you’re looking to be a mini spectator, then hot spot points to perch yourself include the departure Clulb Punchbowl’s Carpark, Bringelly Road, Greendale Road, Wallacia, Silverdale Road to Production Avenue and towards Oakdale towards Picton. If you need the specifics, here’s the route map. It takes seconds to register on the website unless you’ve just arrived in from 1973 and feel the urge to mail in your form. Alternatively, if you can’t make the event, you can easily donate cash to the cause within the website, as a one-time or reoccurring payment. Now you’ve done your bit for charity, treat yourself to a ride over the M1 (Harbour Bridge) and enjoy a night’s rest at Sydney’s affordable boutique hotel, Cremorne Point. With incredible views of the downtown skyline and winning its 4th consecutive Award for Excellence by TripAdvisor, it’s easy to see why Cremorne Point Manor’s a popular gem. Between your charitable contribution to Pink Ribbon and a night’s sleep at the Manor, you’ll not be melting your credit card anytime soon. If you’re heading to Sydney between the 24 – 26 October on business or for a social visit, you must check out the Sydney Blues and Roots Festival. As now one of the city’s most prominent events in the music scene, the stunning village-like historic town of Windsor to the festival is only an hour drive from Sydney. The lineup is pretty hefty and includes headliners such as Busby Marou, The Black Sorrows, The Flood and The Radiators alongside another 32 national and local bands. Unlike San Francisco’s Golden Gate Park ‘Hardly Strictly Festival’ with freebie access, you do need to pay for tickets yet there are early bird passes and consider the 3 day weekender at $149.00 AUD. Alternatively, you can submit an application through the website to volunteer and then you’ll have free access to the venue. Do note that applications for this close 3 October and only 50 volunteers are needed. The beauty of this festival is that, unlike Golden Gate Park’s no-camping rule, the Blues and Roots Festival encourage you to tap into your inner eco meets nature traits. With that in mind, there is a Tent City that’s walking distance to the venue. In this camping ground, you can bring your own tent or camper and for all fabulous glampers, well you’ll probably bring along champagne with your designer rain boots and Burberry hat, and make it a long weekend, right? Take into account there will be a cyclone of food and drink vendors but you can bring your own picnics in the public areas, if you’re looking to keep to a budget. Regarding the lay of the land, the website has a map you can download but for easy understanding, there are various locations that bands will be playing so keep an eye on the schedule and you can plan which band & stage you want to pitch a seat at: Trentino’s is a bar in Windsor, hosting some of the performances yet the Main Stage is in the Oval, where all the action will take place by the big name artists. Then there’s the Roc Boots Stage at the Fitzroy Hotel, at the Inside Stage area. All within easy distance of each other, the shows run from 6pm to 2am on Thursday and 4pm to 2am on Friday. Obviously on Saturday and Sunday the shows start at 10am so you have a full run of music till 2am on Saturday and 10pm on Sunday. Since the ticket prices may have dented your credit card a tad and you’re planning to head back to the city on a business or personal trip, check out one of the most affordable Sydney boutique hotels. If the Festival’s inspired you, take a look at Cremorne Point Manor’s home page video, where the hotel overlooks the Sydney Harbour. It’s a sure bet to blow away your blues now the festival’s over! On Saturday 11th October, one of the most glamorous events of the season takes place – the Moët & Chandon Spring Champion Stakes Day. This ‘carnival’ style trackside event is where all the ladies have the opportunity to parade with their most outrageous hats (Ascot style), everyone’s dressed up to the nines and famous faces are in abundance. With the Moët & Chandon listed races, there’s the famous $400,000 Champion race featuring the country’s best jockeys, horses and trainers. Fashion, fillies and hospitality is a must if you want to mingle with the who’s who of high society. This is a fantastic event for wining and dining clients so remember to bring your picnic hampers, bar platters and flutes for a glass of bubbly. For $20 a ticket, this includes the Myer Fashions on the Field competition, with a prize pool over $100,000. The prizes include a share of the $10,000 in Myer Shopping Spree alongside return economy Emirates flights to Europe, Nicholas Haywood Diamond Set Collection, Longines watches and a cruise sponsored by Celebrity Cruises. Live music is in abundance and only 20 minutes drive from Sydney, there are free buses transporting you to and from the official post race venue within the grounds. Also remember to check out the Clinique Lounge with complimentary make up tips and touch ups! The first race starts at 1.10pm but the doors open nearly a couple of hours earlier so you can get familiar with the lay of the land. As the last race is 530pm, this is a full packed day of socializing at its finest. As the event has a minimum 18 years old age restriction, maybe if you’re a NSW resident, leave the kids at home and pamper yourself for a few hours at the races. After a long day of cheering on the horses, you’ll need a relaxing and inspiring view of the Harbour as the sun settles. At one of the most affordable, boutique hotels in Sydney, check out the aerial video on Cremorne Point Manor’s home page and get racing to the reservations page as rooms book quickly. Do we sound premature in talking about New Year’s Eve? Our rooms are usually fully booked two to three months before 31st December so we wanted to ensure you don’t miss the boat this year. Overlooking the Harbour, guests at Cremorne Point have the most incredible, prime view of the skyline which is a double bonus – our home page video shows the views from the hotel so check it out. Our Sydney boutique hotel attracts visitors from around the world and with the most affordable rates in the area, you’ll have more cash to spend on bubbly, bringing in 2015 in style! 6.00pm: There will be air displays above the Harbour so start rehearsing your ohhs and ahhs. 7.00pm: A fire tug water display will take place as the Ports Corporation fire tug blast tones of water, into the skies. The spray creates an incredible image against the sunset. 8.00pm: Not wanting to be outdone by the water display, the air show rears its head for a second time. 8.30pm: Get ready to be wowed by the Pylon Projections over the Harbour Bridge. Just after sunset, the images project on the surface; a Sydney tradition and well worth putting your canapés down for. 8.40pm: Celebrating the country, the city honours past cultures (Aboriginal and Torres) with red flares fired into the sky from the Harbour Bridge and firework barges. 9:00pm: The Family Firework displays kick into high gear from the Harbour. Eight minutes of up-in-the-air colourful drama...just before the kids are sent to bed. 9:15pm: The sensational Harbour of Lights Parade follow suit with an illuminated flotilla, skimming the water with coloured rope lights. 10:30pm: Get ready for the Inspire Moment with this show stopper, blasting from the Harbour. 0:00am: At the stroke of midnight, the firework displays run for 12 minutes. The firework design is a notoriously well kept secret which is why millions head to the Harbour, Cremorne Point and tune in around the world on TV, smart phones and tablets. Now you understand why we’re suggesting you book your room at Cremorne Point Manor early? Winning a Certificate of Excellence, four years in a row by TripAdvisor, it’s the best spot in the city to bring in the New Year! From the 12th – 14th September, the Australian Dance Festival takes place at Sydney Olympic Park Sports Centre. If you’re heading to Sydney next weekend or a local, your timing is perfect, a bit like the two step. There will be a multitude of dance workshops, performance dance competitions and showcasing the best of Australia’s dancers. You don’t need to be a professional dancer or a dance student, you can simply swing on by and get your groove on with the crowd. Last year’s event was such a success that the Festival organisers are hosting the auditions for 10 of the country’s most prestigious full time dance schools. So if you’re maybe thinking you can jive talk your way through this, alongside a hint of talent, here’s the link with all the details. Now back to the festival, the doors open for registration at 12pm on Friday and by 7pm, the doors are bursting for the country’s Best Dance Crew Competition heat. Within 3 hours, the venue closes but wait… there’s more! On Saturday, at an excruciatingly early weekend start of 7am, the open stage performers rehearse for their showcase. Around 7pm, it’s a great time to show up with your two left feet as the Saturday Performances take place, followed by the Open Stage and Solo Competitions. Twenty four hours later, the Sunday activities including Q&A with Industry Greats, Workshops and Sunday Performances are reaching a crescendo. The finale is set to be outstanding – the Finals Best Dance Crew, Finals Dance Around the World Solo and the Open Stage kicks off at 730pm. Reverting back to the workshops, the schedule has been acclaimed as a ‘who’s who’ of the country’s dance industry. This is where you get to put your Fred & Ginger into action and see if you have pure talent, or a talent for stepping on toes. Either way, the ticket prices for the workshops include seats for the Friday, Saturday and Sunday evening Competitions. If you’re also traveling to Sydney with kids, there’s a special under 12’s workshop session based on prior years popularity. That’ll ensure the kids are exercised and you’ll be pretty much guaranteed they’ll sleep well that night. The tickets range from $30 AUD for evening shows to a full weekend pass (adults) up to $260. This latter price may seem hefty yet it includes all events. And there’s no price on exercise or fun, right? After a long day of trotting around on your feet and cheering on the dancers, what better way to relax than 30 minutes drive away at Sydney’s affordable boutique hotel, Cremorne Point Manor. Winning a certificate of Excellence Award by Tripadvisor, fourth year in a row, it’s enough to make a song and dance about. If you’re a proud book worm, then this weekend you need to be in Sydney. On the 30-31 August, the Book Expo Australia will ensure your nose is knee deep in volumes of hard and paper backs. The nation’s largest dedicated event for authors and publishers attracts around 10,000 visitors so if reading is your vice, your timing is perfect. Attendees are a mix of bookshop owners, book reviewers & bloggers, booktubers, families, individuals, teachers, librarians and journalists so enjoy being in educational company. With over 100 exhibitors, you can check out the Guinness Book of Records attempt for the Longest Chain of Paper Dolls. Yes, you read correctly. Paper Dolls! There are also 6 breakout activity rooms, performance areas including reading and interactive illustrator skills, and a treasure hunt. Everyone receives a show bag upon arrival and there’s a multitude of food, drinks and entertainment to keep all book lovers involved. Just to keep your energy levels up as the venue is vast and skimming booths may cause you to miss out on hidden gems and limited editions. Taking place at Exhibition Hall 5 at Sydney Olympic Park, tickets are incredibly reasonable. From $5 AUD for teachers, kids (12-18 years old) librarians, to $20 for family tickets, $8.50 for adults and free passes for children under 12. At this prime event where die hard readers come to meet well known and favourite authors, you can also hunt for up and coming novelists. The genres are extensive from crime, fantasy, childrens, thriller, action and contemporary to appease all minds. So if you’re really into the rom-com style whodunit with pop up visuals tapping into a modern day thespian theme (is there such a thing? ), there may be an exhibiting author who makes your wish come true. This could also be the time that you explore new innovative learning methods to help yourself or someone with challenged reading. Possibly you have dyslexia; there’s bound to be a book created for you in mind. Or you know a child who just doesn’t get the importance of reading, so is delayed in learning abilities? Snoop around and maybe you’ll find books for the reluctant rugrat. This is also a great place to buy preview books and with a slight elbow twist, maybe the author will sign the book for you. A great, surprise gift for someone who is a huge fan of the author. And only 30 minutes drive from the Park, you can then unwind, open your new books and start reading, overlooking the Harbour and downtown skyline. Staying at one of Sydney’s affordable, boutique hotels is the best way to put up your feet with a good novel. At Cremorne Point Manor, you can read between the lines why Tripadvisor gave the Manor a 4th annual, consecutive Certificate of Excellence Award. On the 29th and 30th August, Sydney Olympic Park (Exhibition Hall 4) will be hosting the Gluten Free Expo. For everyone who can’t even look at wheat, rye and barley without symptoms kicking into high speed gear; this is the event for you! Now in its 10th successful year, from 9am to 4pm both days, you can snack through the booth display food samples galore. There will also be some stage presenters showcasing tips, cooking ideas and facts about foods to avoid and new foods on the market to indulge in. This is also the time to grab a copy of Australian Gluten Free Life at the expo, the country’s first fully dedicated gluten free magazine that launched on newsstands early June. Since around 330,000 Aussies have no idea they need a gluten free diet, this is the expo that will answer questions and give you a day of sampling delicious bites by exhibitors. The booths include chocolate croissants as a showcase piece by Simply Wize and don’t forget to ‘test’ their Potato Pastries. The latter is not only gluten free but has zero trace of fructose or dairy, which is a mild miracle in itself. This is the same culinary team behind the national treasure ‘Crusty Bread Mix,’ the first national mix that takes bread to new heights and maybe the best invention since…sliced bread. If you’re a no meat, fish, shellfish, poultry, eggs or peanut type of person, a must visit is to Amy’s Kitchen booth. Here you will find (amongst a flurry of items) gluten free cheddar and gluten free rice mac & cheese. Yep, gluten’less cheese. Needing kosher, vegan, organic and GMO free foods? Nature’s Path Organic will be a really popular booth for anyone that has a wide range of dietary requirements. With your taste buds running at a rate of knots, don’t forget to sample from Genius Gluten Free, the UK’s leading bakery who will be wowing you with double chocolate muffins, fruit loaf and in true British style…crumpets. Think it can’t get any better? It just did. The Expo is FREE so just swing on by and consider purchasing some items for yourself, friends and family as healthy gifts. Or maybe for business clients who will appreciate foods they can actually eat without side effects. After a long day (or two days) of snacking your way through this event, you can prop your feet at a boutique Sydney hotel, no more than 30 minutes away from the Park. Take a look at Cremorne Point Manor’s aerial video on the home page and see why TripAdvisor gave it a 4th consecutive Certificate of Excellence Award. Sometimes the best things in life come (gluten) free with a bonus freebie view of the famous Harbour and downtown skyline. If you’re looking to splash out, specifically on 12th and 13th September, then you need to head to the ODEX event. The Australian International Scuba and Underwater Sports Expo is the place to be, so go wild over this 3D interactive consumer show. Featuring live underwater action including sports games and competitions, a free educational seminar and all things diving, its two days of jam packed fun. Taking place at Sydney Olympic Park, get flapping over the aqua shots symposium, world underwater games and the national freediving pool challenge, organized by the ODEX team. If you’re in Sydney on business or a local who wants to entertain clients, it’s a really unique event that will take your mind off work and show your guests the Park, at its finest. Maybe treat yourselves to view the Try Dive program where you can see hands-on demonstrations of the latest gear and gadgets for both beginner and novice divers. Calling hockey lovers, you must (yes, must) attend ODEX’s Underwater Hockey Championships and Underwater Rugby events. The focus of these expos are to also encourage attendees to learn more about diving and underwater sports, so expect to see a flurry of exhibition booths at each show. ODEX has a bundle of exhibitions per year and you can keep an eye on these by checking their website or signing up for their newsletter. While you’re planning your social schedule mid September, also take a look at Sydney Olympic Park’s additional events. Maybe take a peek at the the Australian Dance Festival, or if you still have water on your mind, the Cruise Expo will be sailing along in the Showground arena. Tired of water? Then move back to dry land for Life in the Park, educating attendees about urban ecology or for an icing on the cake: Better Homes & Gardens showcase, with lifestyle advice guaranteed to bring out your inner Martha Stewart & Rachael Ray. Only 35 minutes drive west from the Park, you’ll be back at one of Sydney’s affordable boutique hotels where you can unwind and view the stunning Harbour. Need to see more? Then check Cremorne Point Manor’s home page video with a fantastic aerial tour. No wonder why TripAdvisor gave the Manor a Certificate of Excellence Award, for the fourth consecutive year! Spice It Up - Korean Film Time in Sydney! Looking for something hot and spicy to do between 13 -21 August in Sydney? Then your timing is perfect as the 5th Annual Korean Film Festival in Australia (KOFFIA) hits the city, taking place at Event Cinemas, George Street. Showcasing the elite of the elite in Hallyuwood (emerging South Korean cinema), the Film Festival will educate, inspire and show you a thing or two in bringing cultural magic to the big screen. Since inception, the Festival now attracts nearly 10,000 attendees and is rising rapidly per year. This is particularly due to the multitude of industry forums, gala receptions and cultural activities…so not only are you enjoying the movies, but you’re getting a real taste of Korea. The ticket prices are reasonable at around $15 AUD per movie and the schedule is seriously packed with back-to-back movies, 20 in total, all playing in the evenings. The range of movies is truly impressive, from rom-coms to fast action thrillers and this year’s theme, offers a more in-depth insight into the history of Korean movies. Also account that this Festival is pretty much an Australian road show, featuring over 80 screenings total between Sydney, Canberra, Brisbane, Perth, Melbourne and Adelaide between 13th August and 26th September. So if you’re a diehard fan, you can then hop around the country, and enjoy around 6 weeks of cultural cinematography. Ever heard of Park Joon-hoon? He’s worked with many directors including Academy Award winner, Jonathan Demme (Silence of the Lambs, Philadelphia and The Manchurian Candidate) and will be the starring guest for the Q&A on 15th August at 6.15pm so keep that in mind. It’ll be good! The quirky part about this festival is their Facebook page. Usually movie Festivals tend to have static, corporate posts and updates, all very yawn worthy. But the KOFFIA’s page is amusing and showing sheer personality in their status photos. It’s also worth liking the page for the previews of featured movies. Only 15 minutes drive from one of the most affordable boutique hotels in Sydney, and a 30 minute trip using public transportation, get your popcorn at the ready because after the Festival, you’re going to view a spectacular, never ending, free movie. Yes, from this hotel, you’ll have the best seat in the house to watch the stunning Sydney skyline and Harbour Bridge. Don’t believe us? 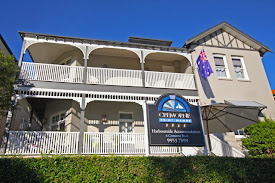 Then take a look at the video on Cremorne Point Manor’s home web page and see for yourself. Lights, camera, action and final cut! Blowing our own Testimonial Trumpet – toot toot! It’s also great to note that we’ve been given the Tripadvisor ‘Certificate of Excellence’ Award for the fourth consecutive year. This is quite a rare achievement for an independent, boutique hotel! We’d love to hear from you so please go ahead and write on our Facebook wall, Tweet us and also share our pins. Everyone loves to support a local business, right? In our case, we really want to support you, traveling to Sydney on a budget without a bottomless wallet, yet want to experience all that NSW has to offer, on a budget. Also share your photos with us socially – we love that. While you’re staying with us and need anything specific, let us know. If something’s not up to par, ping us. Any particular requests before you stay with us, we’re all ears. On a side note, we’re so close to Taronga Zoo, you can sometimes hear the lions roar at night. Alongside free Wi-Fi and breakfast, it’s quite a nice added bonus!